Very pretty cocoa brown leaves have fine hairs on them that give them a kind of metallic sheen. 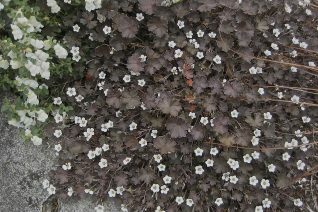 Everything about this plant is the same uniform cocoa color save for the dime sized white flowers which appear continuously as long as its warm and provide welcome contrast. Mounding evergreen plant to 6″ tall and 20″ wide. Full sun and rich,well drained soil with regular summer water. Takes less water in richer soil. 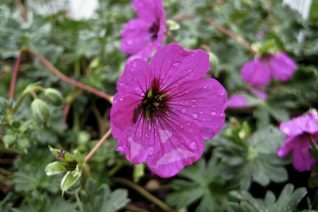 A very pretty and durable New Zealand native Geranium. Not bothered by slugs and snails. 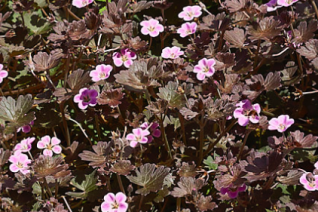 Cute little spreading New Zealand Geranium with pewter brown leaves with silver sheen and small off white/pink flowers all summer long. To 4″ tall but spreading to 11/2′ wide. Great in containers where the foliage provides contrast and the trailing stems clad in flowers arch over the edge of the pot. Very easy to grow and may self sow a bit. Easy to identify the seedlings to dispatch, transplant, or give away. Full sun to part shade and rich, well drained soil with regular summer water. Not bothered by slugs and snails. 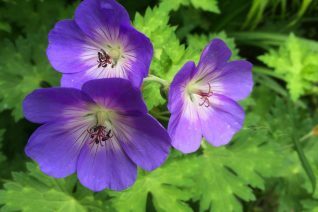 Many hardy Geranium have lost favor because they are either huge and unwieldy perennials or they don’t bloom for long enough. This one does neither. A low compact tuft of silvery foliage mostly stays put. Beginning in spring and continuously through summer simple copious purple flowers appear with a lavender back drop and dramatic darker raspberry veining. Very pretty- in combination with the foliage its a winner. Floriferous enough to be used in seasonal containers. 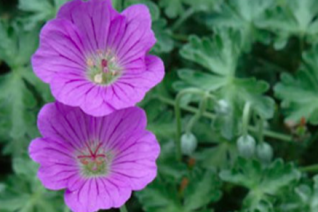 This hardy geranium appreciates full, hot sun and open site and well drained soil. Light but consistent summer water. The flowering stems will elongate and climb through nearby plants and flowers will show up where you least expect them. Foliage clump to about 18″ wide. Completely winter deciduous and not bothered by slugs or snails. An older cultivar of the shade loving mourning widow geranium. Lily is set apart by deep purple blue large nodding flowers. To 28″ tall and forming an expanding clump of handsome serrated leaves this perennial requires protection from bright sun to really perform. But avoid dense shade, so we’ll say high overhead dappled shade or part shade. Grows in any soil but appreciates some amending to start out. Regular summer water. In rich soil it requires less. Blooms appear in late summer and pop off and on all summer. Really pretty color on an old fashioned but tough shade perennial. Not bothered by snails and slugs. Oh, thats why we love Geraniacae. 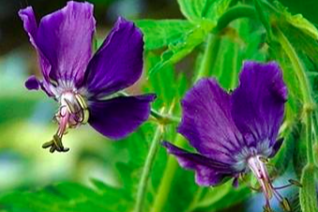 Silver foliage and purple flowers an unforgettable combination on this smaller hardy Geranium that likes to spread. The dense foliage is compose of metallic silver leaves and would be enough of a reason to plant this dry loving plant. 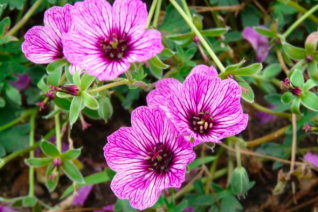 In combination with the the 3/4″ purple flowers and you have a real show. To no more than 6″ high an individual happy plant will spread to 2′ wide in a season. Blooms continuously for us all summer. Full sun and very well drained soil with light summer water. Excellent rock wall candidate or growing over a wall. Very good in seasonal containers as well. Cut back hard in early spring. Not bothered by slugs/snails. Where one needs a little blast of neon magenta this extraordinary and long blooming hardy Geranium can oblige. Clump forming plant with wiry trailing stems that wind through other plants before displaying the 1″ wide neon flowers. Full sun and rich, well drained soil with regular summer water. An excellent species for our climate. Carefree and long lived and that flower color- wow, nothing quite like it. Magenta. Possibly the best hardy Geranium ever selected. Sky blue flowers with a slightly white center appear non-stop from June to frost on this vigorous and flowery perennial. To 18″ tall and twice as wide or more. Well drained soil of average to rich fertility with light consistent summer water. Planted adjacent to shrubs and trees this perennial may actually act as a climber- rambling up into lower branches and displaying its cheery blue flowers up high. Full sun to light shade and regular summer water. Winter deciduous. As with all hardy Geraniums it shows great resistance to slugs/snails. Unauthorized propagation prohibited. PP#12,175.